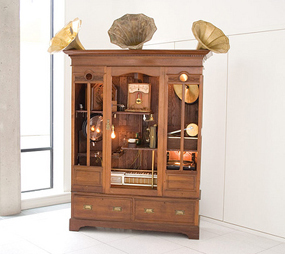 The evolution of pop music could be set to take another turn with the introduction of Cybraphon, a machine that plays different music depending on its mood. Cybraphon spends its day surfing the internet, looking at Google and its own Facebook page, every website hit it gets the happier it becomes. The machine was created by avant-garde musical collective Found who teamed up with Professor Simon Kirby from Edinburgh University. Cybraphon is the latest project from Edinburgh-based artist collective FOUND. Cybraphon is funded by the Alt-w Production Award administered by New Media Scotland and will be unveiled at the Edinburgh Arts Festival on 5 August 2009 in Inspace Gallery (Inspace, Crichton Street, Edinburgh EH8 9AB). On 13 August from 8 pm, there will be a special event at the gallery where FOUND will talk about the making of Cybraphon and then perform live in a head-to-head battle of the bands with their creation. To book your free place go to cybraphon.eventbrite.com.